“The most important thing is to use common sense in deciding what is safe and what may prove dangerous. Be sensible about what your body can tolerate, and enjoy it,” says Mark. Harrington Grove Country Club invites you to our Wedding Open Day being held on Sunday 13 October, 2013 from 11am till 3pm. If you’re looking for the ultimate location for your Wedding Ceremony and Reception, Harrington Grove’s state of the art facilities and hospitality is Macarthur’s premier venue offering style and elegance. 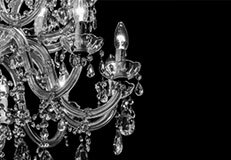 Romantic Wedding packages and Cocktail Receptions are available and our event managers and wedding co-ordinator will be available on the day to share and design your bridal vision. Sunday Sept 15 promises an extravaganza of local goodies & displays for Fair entrants. Stroll and browse stands of fresh flowers and homewares by Merci Bouquet, DIY jewellery Lockets & charms by Lilyanne Designs, You’re Invited event stationery, Lisa May’s luxurious scented soy candles, Ponytails & Parasols girly boutique and vintage accessories, Sammy & Lola gifts - stationery and craft supplies, Taylor Made embroidery, gifts & babywear, Family portraits by Orchid Kruse Photography, creative hire props and marquee theme by The Diamond Peacock. You’re guaranteed to bag a bargain and love the creative displays! Our fun family event on Sept 15 promises great gourmet treats for all. Pretty Picnics will prepare BBQ lamb, beef & vege skewers, burritos, chicken wings & cheeseburger sliders.. Cupcakes in Camden showcase their delicious cupcake buffet from pecan pie to mocha mocha goodness, Mr Whippy will serve all his classic faves, and sweet treats including Dutch pancakes, tropical punch and Devonshire teas served by That Vintage Caravan.. We’ve got the catering covered! Enjoy our super day out on Sunday Sept 15 with fair goodies and wines at the Grove Bar, or boutique beers by the Riverside Brewing Company. Relax on a Pretty Picnics rug, banquet table & market umbrellas, or spread out on the Grove amphitheatre grass and settle back to the tunes of live music and spring time ambience. The ‘Jumping Fleas’ stomp Band will get the day started from 11am, followed by well known tunes from guitarist Tom White, then lovely local singer Jemma Beech with her sweet vocals. Our event promises fabulous family value and entertainment! Father’s Day is the chance to spoil Dad and remind him about how special he really is. Book your table now and bring the family along for Dad’s special day at Harrington Grove. 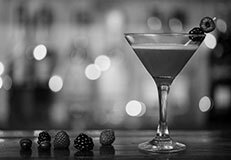 Breakfast at Harringtons Bar + Grill is available from 9am, and Lunch in our Fairfax Room from 12.30pm will include live music entertainment and welcome beverage for Dad. 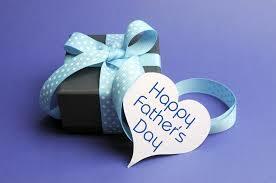 Father's Day brekkie & lunch menus are available here. Call us on (02) 4631 3200 or see our Restaurant page to make a booking. 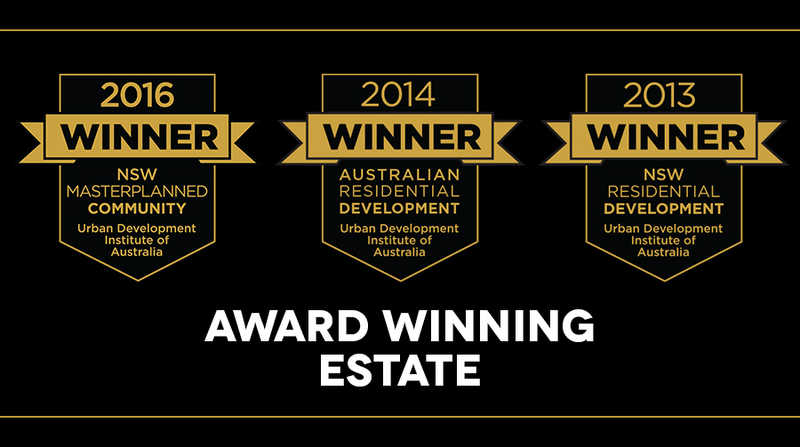 Harrington Grove is honoured to be awarded the prestigious Residential Development of the Year (2013) by Urban Development Institute of Australia (UDIA NSW) at the Awards for Excellence Gala Dinner on Friday 26 July 2013. This award recognises Harrington Grove as the best residential development in NSW / ACT. 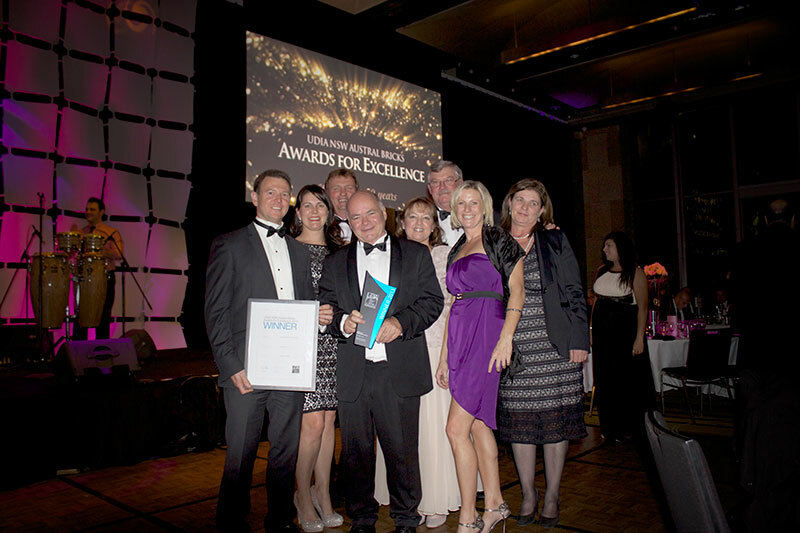 Harrington Grove’s commitment to building a lively and cohesive community, buzzing with activity was recognised by the UDIA NSW when awarding Harrington Grove with this top honour. Just seven weeks after the creation of the new precinct Magnolia, construction is already underway with the first concrete slab having been poured on lot 77 last Wednesday. Construction of the first home in the area is always an exciting time, as it represents new beginnings and heralds the commencement of neighbouring homes, which are never far behind. Named after the magnificent wall of Magnolia trees being planted along Camden Valley Way to create a unique and spectacular floral backdrop, 'Magnolia' is situated directly opposite the Forestgrove Drive entrance and features bushland reserves, walking trails, cycleways and is convenient to shops and schools. A sister to the Harrington Grove Country Club, the Magnolia Club will follow in its footsteps of class and style. Construction on the Magnolia Club will commence later this year, and it is scheduled to be open to residents by summer 2014. The Magnolia Club is the first of two community neighbourhood centres to be built in Harrington Grove. Magnolia Club will be the ideal place to meet and socialise with fellow residents, as well as a fantastic place to entertain family and friends. The Magnolia Club will be home to a luxurious swimming pool for summer and raging fireplace for the frosty winter months. The Magnolia Club also includes a full-sized tennis court, barbecue facilities, picnic areas and kitchenette facilities for all gatherings. This June, Harrington Grove proudly released 73 new registered homesites in Magnolia. With the smallest lots measuring in at 702m², each homesite is generous in size and complemented by the many bushland outlooks that combine well with the great sense of privacy. Magnolia is categorised by beautiful Magnolia-lined streetscapes, creating a unique atmosphere that is distinctive to Harrington Grove. It contrasts against the previous precincts, which all featured Australian Natives as their namesakes. Magnolia is unique to Harrington Grove and is complimentary to the rest of the estate, adding further diversity to the evolving Harrington Grove environment. One of Magnolia’s key features is Magnolia Walk, a grassy thoroughfare containing a walking path that dissects the precinct, adding character and convenience for residents. These land linkages are all part of the Harrington Grove pathway network, which is central to the sense of community that is so integral to the neighbourhood culture. Recently, Harrington Grove residents were treated to an afternoon of musical entertainment in the Country Club’s amphitheatre. Students of Macarthur Anglican School performed a wide selection of contemporary, popular classics and cover songs such as Neil Diamond’s "Medley", The Beatles, Christina Aguilera, right through to Handel's, "La Réjouissance" throughout the afternoon. Residents and guests enjoyed a beautiful day at the Country Club taking in the 'Sunday Sounds'. 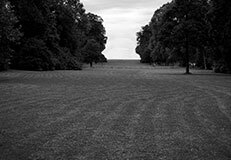 Turning into Harrington Grove’s tree-lined driveway, you immediately notice the magnificent grounds; the work of talented on-site nurseryman, David and maintenance experts, Andrew, Chris and Vince. David manages the estates’ on-site tree nursery which turns over approximately 500 trees annually of mostly large, ornamental, deciduous trees such as Maples, Pyrus and Oaks. David has been involved with the Harrington Park development since its inception in 1994, having set up the on-site tree nursery in preparation of the landscaping requirements of the estate. During the development period, David and his team have been responsible for planting all the trees in the streets and parks of Harrington Park and Harrington Grove. Dianella is the latest precinct at Harrington Grove and was launched in August this year. 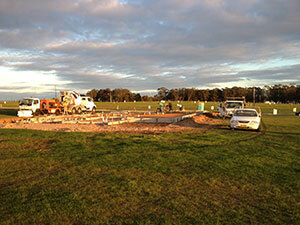 Already the subdivision work is complete with landscaping progressing well. Named after the local flora 'Dianella longifolia' found growing around the estate in summer, Dianella offers homesites ranging from 702sqm to 1167sqm; most of which are large, flat and easy to build on and encompassed by bushland. Residents at Dianella will love the convenience to the Country Club as well as the close proximity to the Harrington Green Neighbourhood Centre which, when built, will also have a swimming pool and barbeque area. There are 90 homesites at Dianella priced from $280,000. For more details contact the sales office on (02) 4631 3200 or register your interest on the contact page. To date there are five precincts released at Harrington Grove, all named after botanical names of local flora. The first was Araucaria which was released in September 2008 and comprises 105 generous homesites of various sizes. Second to be released was Maculata with homesites set amidst beautiful bushland. Most have views of the surrounding landscape as well as district views towards Camden. Many homes are now occupied with another 38 currently under construction or due to start shortly. The third precinct released was Lomandra Rise distinctive for its elevated position and picturesque bushland setting. All homesites are 720sqm or larger. 22 homes are currently under construction. The Vidlers enjoy living at Harrington Grove so much that now three generations of their family are living here. It was the lifestyle, the great community and the scenic surrounds of Harrington Grove that appealed to Deborah Vidler …as well as being near her family. She is looking forward to meeting new friends and neighbours and seeing the community grow. Whilst awaiting completion of their new home at Maculata, Deborah and husband Max are staying with son Robert and his wife Kim at their Araucaria home. Two streets away, also in Araucaria, live Robert's sister Kristie, her husband Richard Dent and their three children, who recently relocated from Queensland. Not only do the families live within two minutes from each other, they nearly all work together in their business, M & D Plastics Pty Ltd, which is conveniently about to move to nearby Smeaton Grange. "We have really enjoyed the cocktail parties and met quite a few people already. There is a terrific community spirit; my daughter and her family have met people around the pool and my son and son-in-law have both joined the golf club," says Deborah. "We've met lots of people through the golf club, which plays a different golf course once a month. The club has about 20 members of all different standards," says Robert. The entire Vidler family are enjoying different aspects of living at Harrington Grove however all agree that the sense of community, the Country Club's great facilities and the picturesque setting all add up to a great lifestyle for each generation. The majestic homestead perched on the hill at Harrington Park is currently undergoing some repair and conservation work. The homestead began its life as a humble stone and clay brick cottage when it was built by Captain William Douglas Campbell in 1817. Over the years it passed through many different owners and has had various extensions, changes and uses before growing into its present form; an elegant Georgian style home with a Victorian veranda. Sir Warwick Fairfax bought the homestead in 1944 as a weekend retreat and it has remained with his wife Lady Fairfax since. Sir Warwick made extensive alterations to the homestead and he spent much time there with his family reading and writing. He wrote several plays, three of which were performed in Sydney, and he also wrote a philosophical book during this time. "Although the homestead is currently covered in scaffolding the actual work being done is more like gentle repair, fixing joinery and some under pinning," says Lester Tropman, of Tropman & Tropman Architects, specialists in heritage conservation. "The work is being carefully undertaken to respect the home's Fairfax history; to repair it to good order so it can be used as a family home again." The Harrington Grove Country Club has four rebound ace surface tennis courts for the use by residents of Harrington Grove and their guests. Earlier this year, we formed the Racquet Club, which is run by our Director of Tennis, John Thompson. The Racquet Club has various coaching programs available for adults and children, which include initiatives by Tennis Australia, plus much more. Coaching terms operate over 10 weeks and these coincide with school terms. During the school holidays we hold a number of activities including a 'Tennis and Sports Fun Camp' for children of all ages. Children are welcome to bring friends and family along to the camps. The next camp will be held between Monday 16th and Thursday 19th January 2012. If you would like to find out more about the programs or holiday camps, contact the community team on (02) 4631 3200 or visit www.grovelife.com.au. Stay tuned for more action on the courts in 2012. The Harrington Grove Social Golf Club was formed earlier this year by some of the residents. There are currently 26 members and growing. We welcome new players of all playing standards. The first year of the Harrington Grove golf season has drawn to a close with the 2011 Club Championship being played out and won by Scott Granger. The season's end was marked by a November weekend away in Bowral where a great time was had by all; lots of golf and loads of fun. The weekend ended with a presentation back at the Country Club where trophies were presented. Congratulations to Scott Granger for his win over Chris Young in a very exciting final played on 16th October at Camden Lakeside. Both men played well however it was Scott's day, playing excellent golf with a fine short game. A huge thank you to everyone who contributed to the new club and to the club organisers Jim, Michael and Gary. 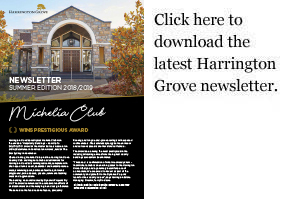 If you would like to find out more about being part of the Social Golf Cub, contact your community team on (02) 4631 3200 or visit www.grovelife.com.au. Harrington Grove's Spring Fair, held on Sunday 13th November, was a fun filled day, with beautiful weather accompanied by jazz music, tantalising roast lunches and finished off with pool entertainment. 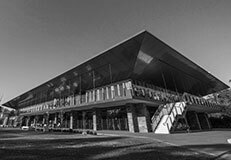 The day commenced as Jess Pollard Trio and Champagne Sundaes performed impressive modern and traditional jazz music in the amphitheatre. While parents indulged their tastebuds with spit roast lunches with various choices of succulent meats and freshly made salads, the kids got wet and wild on "Skull Island". Some even had a game of bocce on the lawn and a friendly cricket match with their neighbours. It was a great day of entertainment, food and activities for the whole family. Residents at Harrington Grove can now enjoy the Country Club's stunning sporting and recreational facilities for longer hours during the summer and holiday period. Our sensational fitness centre, well equipped with the latest in cardio equipment including treadmills, cross trainers, bicycles and rowing machines, is now open six evenings a week from 6pm to 9pm. Swimming in our fabulous 25 metre swimming pool is also a great way to keep fit and the pool will stay open, along with the children's paddling pool, until 7pm Monday to Saturday. Alternatively, enjoy a game of tennis on one of the four tennis courts which are open from 8.30am to 9pm every day of the week. Take advantage of daylight saving and the extended opening hours and enjoy the Country Club's barbeques which are available for use until 9.00pm every evening; what a great way to catch up with friends and neighbours for a casual dinner after work! Tennis court and barbecue lights can be turned on at the light box located at the entry gate to tennis court 1. Residents can access the facilities through reception or via the side gate adjacent to the driveway. These gates will be open from 8.30am to 9.00pm every day, however, you will need to use your access card to open the gates located at the top of the stairs. Change rooms can be accessed from outside using your access card. Lights will automatically turn off at 9.00pm promptly and all gates will be locked. Residents are kindly asked to vacate by 9.00pm.